I remember I had some dramas getting the OfficeExtend APs initially set up, so here are the firewall rules you need to get the Cisco OfficeExtend access points (OEAP) working. The setup assumes you have a DMZ controller which will have mobility anchors into the internal or “Inside” controller. I spent some time a year or so back getting it going and it has been a good solution for extending the corporate wireless lans to wherever it is required. Obviously, security should be of concern so at least ensure you are securing the WLANs using certificates, RADIUS and AD authentication (WPA2 Enterprise) at minimum. In my case the 602 model AP can provide 2 WLANs as well as a “Remote LAN” connection which I use to plug in a Cisco IP phone for those that want a hard phone coupled with the AP. Be careful of the remote lan port – it essentially is a port that is tunneled straight onto your inside network (which is why the phone works). Google Blake Krone’s 602 AP review for more detail on the OEAP setup – he helped me out a lot and could not have done it without his assistance….thanks Blake! 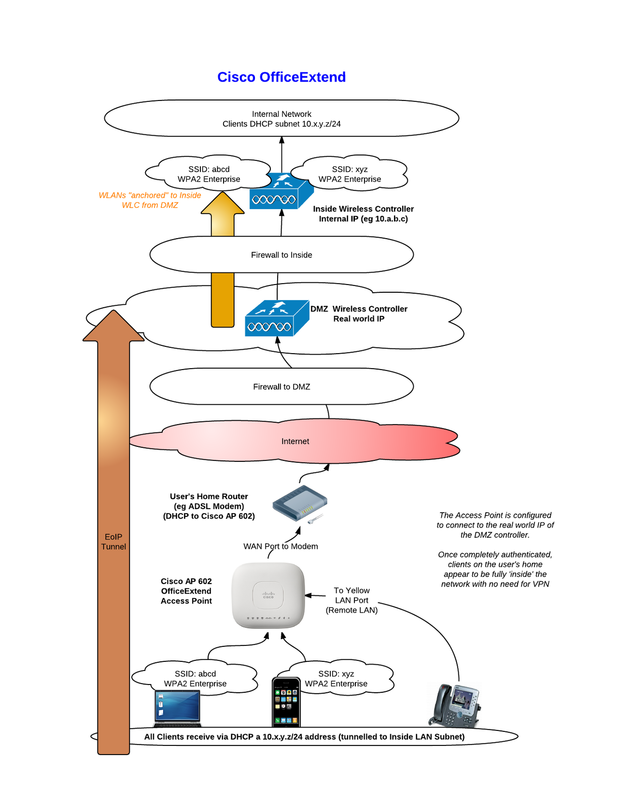 This entry was posted in borderless, cisco, firewall, oeap, OfficeExtend, Wireless on August 4, 2012 by Cameron Stockwell.